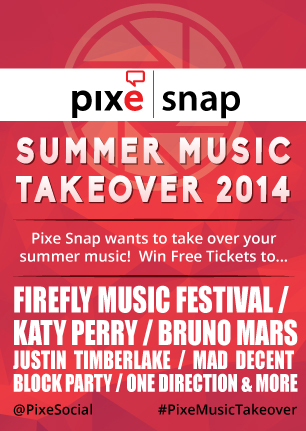 Pixe Social, the provider of popular mobile and tablet-based social marketing solutions, announces that the Pixe ​Snap Summer Music Take Over Contest Series has been awarded the 2014 Internet Advertising Competition’s MobileWebAward. Pixe Social’s social and attendee engagement solution was judged the winner in the Best Social Network Mobile Application category. Pixe Snap, a gamification-based native app available for free download on iOS and Android devices enabled consumers to share their fan pics for featured artists and bands included popular acts such as Katy Perry, Justin Timberlake, and One Direction with their social media networks on Facebook, Instagram and Twitter in real-time. In addition to this award, Pixe Social’s attendee engagement and social promotion solution for IMEX Frankfurt was selected for the MobileWebAward in the Best Events Mobile Application category. Pixe LLC, a leading technology provider, leverages user-generated content while engaging customers with brands through marketing promotions, delivers enhanced online engagement. Pixe enables businesses to secure 'photomonials' from existing customers to reach out to a phenomenally large base of potential customers on Facebook, Twitter, and Instagram, thus converting audiences into brand ambassadors.